This book is a good read for those who want to understand some of the basic principles and beliefs of Christianity. Many major topics are covered, examining multiple approaches to those topics, and giving criticism. The focus of the book, rightly describing Christianity, is on a Christ centered belief system, where the causes for the poor, the discriminated, and alienated are held at high importance. Reading and understanding the material was easy, as it was organized and presented in a user-friendly format. There was a nice mixture of common words along with religious terminology, which again, aids in understanding. With this said, it is not a quick read as the material is hefty.All in all, I learned a lot from this book, and the author did not seem to present too much bias, that is, until the last chapter. I cannot make up my mind concerning the chapter of eschatology. I liked the unique approach that was taken, which went beyond defining views such as amillenillism, post-tribulational, and such. The main focus of the chapter was a discussion on the basic, universal Christian hopes and reaction to those hopes. But I am also really troubled with this last chapter, as he readily dismisses those who believe in the Rapture, but does not give any explanation to defend his argument. Then, he talks about essential symbols of Christianity, such as hell, questions them, and states that they are only symbolic, and should not be taken literal. I was very discerned by this. I almost knocked the book down to a four-star rating on this one rough chapter. Ultimately, if you want to learn, through unbiased explanation, the basic beliefs behind Christianity, and how it should be conducted, this is a good book. But if you are looking to expand you knowledge about specific books of the Bible, or about apocalyptic beliefs, this book does not aid in these areas. The first theology text I read all the way through and enjoyed while I learned, and I am not saying that because I am friends with the author. I read it before the Presbyterian ordination exams in 1991ish, and really loved it. And it helped. I teach Introduction to Christian Theology at Thorneloe University. I have often said that this subject needs two courses. There are a lot of great later systematic theologies like Stanley Grenz's Theology for the Community of God, Joe Jones' Grammar of Christian Faith, Robert Jenson's Systematic Theology, or McClendon's Systematic Theology. But those are too large for single courses.But in the case of a single course introduction, one is really strapped to find good smaller introductions. 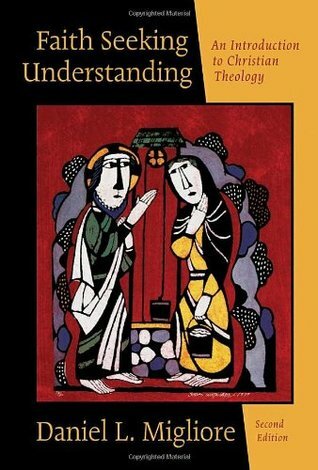 Thomas and Wondra's Introduction to Christian Theology, a more liberal Anglican introduction, which the course I teach currently uses, is well researched, but often skips right into very abstract topics without giving a simple overview of the doctrinal basics. Similarly, Alister McGrath's Christian Theology: An Introduction is good, but it is like sipping wine through a fire house, cramming so much in such a small space. Finding Daniel Migliore's Faith Seeking Understanding, especially this newer addition, has deeply impressed me. Migliore is able to present topics in a succinct yet comprehensive manner. He is ecumenically minded and global-minded. His theology displays a sensitivity to Black and South American liberation theology, feminism, and Asian theological conversations that are often ignored by mainstream western, male-dominated theology. His chapter on dialogue with other religions, notably Judaism and Islam, is just the thing that needs to be in an introduction. Migliore is a good writer that gives a certain richness to topics that are often very dry.I don't know what I would have done differently. I am not the master Migliore clearly is. I thought his section on the atonement was a bit too short for how important the topic is. On every chapter, there was, of course, much more he could have gone into, but A good introduction delivers substance but does not overload. It wets the proverbial whistle, which Migliore definitely does. Each chapter informs the reader, but also invites them in deeper. Easily the best 'introduction to theology' that I've ever read. Having taught the class myself once or twice in years past, I would unquestionably use this book again -- even in an environment where English is a second language. I have to wonder if the folks who wrote the first reviews read the same text that I did! This was my basic text for an intro. theology course I took at Princeton, where Dr. Migliore was teaching. He is classically trained, very disiplined, and a real gentleman. But, as this book demonstrates, he can't be termed a great theologian. While he claims to be a Barthian, and he does use Barth's categories, he would not be recognized as such by Barth. He might be described as more a "string of pearls" thinker -- he takes things he likes from a variety of contradictory sources, with no apparent anchor or controling principle. What you get is more of a "mood" than a tangible response to God's voice in Scripture. This is a very weak, very inconsistent, very frustrating work. I hardly ever score things poorly on Amazon, but I had to comment on this when I saw the other glowing reviews. There are all kinds of good theology texts, both to the "left" and to the "right" of Migliore. Louis Berkof, for example, is a classic that is clear and helpful. Reading this book is as refreshing as drinking from a muddy river. This neo-orthodox writer is promoted as major defender of the Reformed Church and Christian orthodoxy. Occasionally backing Biblical soundness, Migliore undermines the very Word he is describes and investigates. I have read better from the papers used to line the bottom of parrot cages... after being soiled. An ok introduction into systematic theology. Migliore offers up a kind of Christocentric liberation theology. Like some liberation theology, it occasionally paints in broad brushes and lacks discretion. Migliore definitely wants to have his cake and eat it too. On a given doctrine, he offers up a “thesis” (usually a premodern/traditional position) then an “antithesis” (usually a modern or liberation position) then a “synthesis,” in which he marries the best of both worlds. But this rhetorical move gets old after a while; it seems as if he’s able to do what no one else can: marry premodern/traditional theology with modern/liberation theology. In the back of the book he’s included some hypothetical conversations between pioneering theologians that are sort of interesting, as well as a glossary of theological terms that readers will find helpful. Often I will look to sell books after class, but this one I will keep and I have even jotted some things down that might be good to explore in sermons. In fact, I have quoted from this book in a sermon already. Migliore's writing is quite beautiful and is also well organized. I like the use of numbered points with italicized statements. It makes the book easy to work through and digest. He presents a lot of information on different theologies around key doctrines, discusses weaknesses and strengths of them, and presents his improvements upon them. Improvements might be a strong term, but I'll leave it there. The underlying theme: it's the Trinity. Always the Trinity. 10 outta 10 would recommend. Being the slight theology nerd that I am, I would say this is a great book for someone to start off with. It is easy to understand, extremely engaging, and will cause you to delve more into what you believe and why. This book will also give you a good foundation to lead into many other theology books that may strike your fancy in the future. A required text for Theology Overview class. Provide a good overview of the various doctrine beliefs in Christianity. Faith Seeking Understanding is an introduction to systematic Christian theology, which is the practice of understanding God according to the structure of the Apostles Creed. I had read parts of this book while in seminary, but years ago I wanted to read it all the way through because I thought it was a great resource. But it's sat (dusty) on my currently-reading shelf for a long time because I abandoned it part way through. Turns out it's a tough book to read all at once. Last fall I decided I wanted to take it up again, but this time I decided to read one chapter between other books. That format worked much better. The writing for this book is good and sharp, but very academic. For someone almost 10 years out of seminary (or for a lay person, I would guess), sometimes the text can feel inaccessible. However, I would say this book is rich with insight into theological concepts and would be a good primer for someone beginning the task of theology.------review 2008------I have already read substantial parts of this book during seminary, but really desire to read it all the way through. Will have to go over it again when I have more time. Two things I took away from the book are: 1) He should have focused on how the 'basic' doctrines of the Church look through the eyes of a Trinitarian theology. I say this because he brings this up multiple times and so he probably should have gone that route. 2) He falls back too much on what Luther, Calvin, and Barth have to say. He goes out here and there to other theologians from various Protestant traditions and from the Catholic tradition, but it would be nice to have a more rounded view for an Intro book. Otherwise have the name 'Reformed' in the title. This was one of the textbooks in my Introduction to Theology class in seminary. I don't think we read the whole thing in that class, just selected sections/chapters, so I decided to go back and read it cover to cover. Overall, I think the book presents a good survey of theological disciplines (theology, Christology, pneumatology, ecclesiology, eschatology, etc. ), always making a balanced and thoughtful presentation and often using an unabashed trinitarian focus to find a middle way between extreme positions. This book seems like a good introduction to theology. This is one of the best introductions to Christian Doctrine that I have read yet! It somehow amazingly serves as both an introduction for beginners and also as a challenge for long time Christians to reaffirm the central goals in pursuing doctrinal convictions. I have used it for a college course on Christianity and for my own personal growth and understanding. I highly recommend it. I really liked this basic theology book. It deals with many different views on many different topics such as newer cultural and ethnic views of Christology, just to take one example. I think that given the amount of material that it is trying to deal with and the voices and views it is trying to include, Migliore does a great job. This is a general introductory book to Christian theology. Really great 'sampler' that addresses a number of core topics in an accessible way. If that's what you're after, this book is the best. If you're after something more detailed, or deeper, or something that wrestles with the big issues.... this is not going to satisfy you. Wonderful intro to systematic text!Wonderful intro to systematic text! This and Cone's Black Liberation were by far my favorite texts of the multitude my classmates and I were assigned. an excellent introduction to Christian theology written so the average person who cares more about knowing God and loving others than she does about theology can appreciate. parts of it deeply moved me. About 30% of it was a good introduction to theology, which doesn't end up being a lot of pages. 10% of it is just the author talking about his biases. The other 60% was filler. A lot of saying the same thing over and over. Overall, a lot of pages to say a couple of things. Most theology books that I have read talk about the various beliefs that Christians hold. This book covered basic Christian theology. As I continue to study theology I keep seeing the importance of right theology. I still have a lot to learn. This is a clear, concise, but nevertheless exhaustive introduction to the broad sweep of Theology. It errs towards the Barthian perspective, but so long as you bear this in mind it isn't a big problem. Very, very good. I enjoyed her style of writing and self reflection very much. Also I agreed with almost everything she was saying and all of her points as it reflected largely what I was going through in my life as I read, which certainly affected my response and opinion towards the book. I already "read" this book for my Christian Theology class in college. Now I'm "re"-reading it because I find it very useful in addressing important elements in theology. This book covers a lot of areas thoroughly and is fairly informational. This is my go-to book for the basics and major topics of Christian theology. Migliore articulates theological positions that I consider orthodox, but which also fit my progressive framework. This is a very readable systematic theology. He covers a lot of ground and gives a flexible and workable system that conveys a humane and enriching theology. Union would have been so much easier if I had this book my first semester. Really solid overview of Systematic Theology. Read for class. A great introduction to contemporary theology. Do you like boring theology, than this book is for you. Interesting topics but a very boring read. The only people who should read this book are the ones who need to read it for class.